07.16.11 A strong field turned out for the New England Friendly Downeast Open played at Southern Maine Community College on July 9-10, 2011. 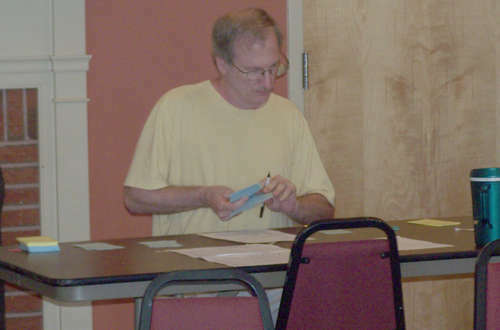 Roger Morin captured first in the open section with 3.5 points in four rounds. Nick Parsons put up 3.5 points himself to take first in the U1650 section. 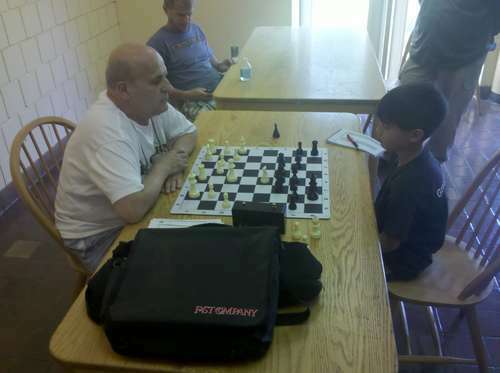 Gheorghe Teodoruscu won the one-day Rated Beginners Open with 4.5 points. Here's an illustrated tournament report, USCF crosstables and two selected games. 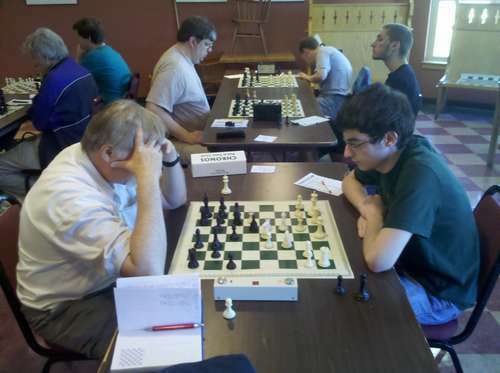 Tournament winner Roger Morin (right) plays Lance Beloungie in round four of the New England Friendly Downeast Open played at Southern Maine Community College on July 9-10, 2011. Thanks to Dan Fishbein, Roger Morin and Phil Lowell for contributing to this report. 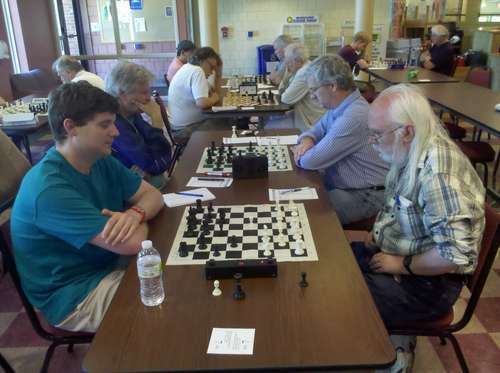 The New England Friendly Downeast Open was a two-day, four-round event with a time control of G/120. Many stronger players prefer this more relaxed pace as opposed to G/60 or quicker sudden death time controls. Former two-time Maine State Co-Champion Roger Morin came out on top with three wins and a draw enough to give him clear first place in the open section. Morin's only draw came at the hands of 2010 Maine State Champion Lucas McCain. Just off the lead sat Matthew Fishbein with 3.0 points earned with two wins and two draws. Trailing Fishbein with 2.5 points were Lucas McCain and John Gaspar. Phil Lowell, Lance Beloungie, Ethan DiNino and Max Berube tied for 5th place with 2.0 points. Thomas Laaman took sole 9th place with 1.0 point and Andrey Savov and Rob Shore rounded out the crosstable in the open section with half a point apiece. In the U1650 section Nick Parsons took charge with 3.5 points on three wins and a draw. Interestingly, his draw came in the first round with Stephen Kaluzynski. William Burtt took clear 2nd place in the U1650 section with 3.0 points. Frank DiRenzo, Daniel Blessing and Lee Doucette shared 3rd place with 2.5 points. Jon Malev and Steve Kaluzynski put up 2.0 points. Alex Wallach scored 1.5 points for sole 9th place. Michael Parsons and Charles Rotmil each scored a point and Don Landry went scoreless for the tournament. Gheorghe Teodorescu won the rated Beginners Open with 4.5 points. He was trailed closely by Dennis Lemieux (4.0) and Ian Youth (3.5). Aidan Feeney scored 2.0 points and Anthony Pelegrini finished with 1.0 point. This tournament was organized and directed by Phil Lowell. 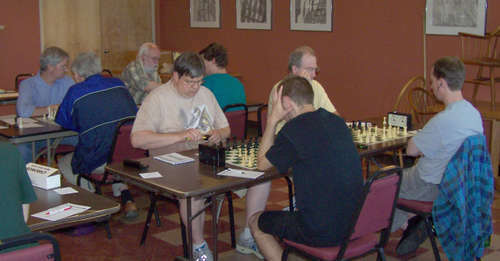 Lance Beloungie considers his position in his game vs Roger Morin while Matthew Fishbein (facing) plays Lucas McCain in round 4. A closer look at the game Fishbein (left) vs McCain. Thomas Laaman (foreground left) plays Ethan DiNino and Phil Lowell (background left) tries to keep John Gaspar at bay. 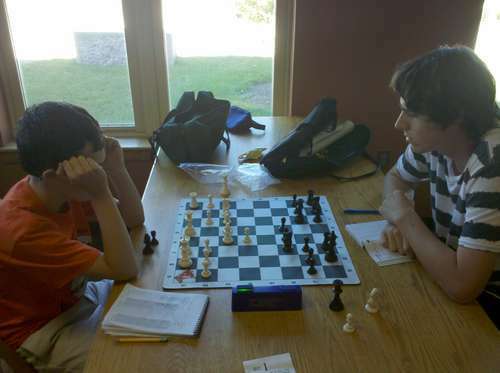 Max Berube (right) is on the move in his game vs Rob Shore. 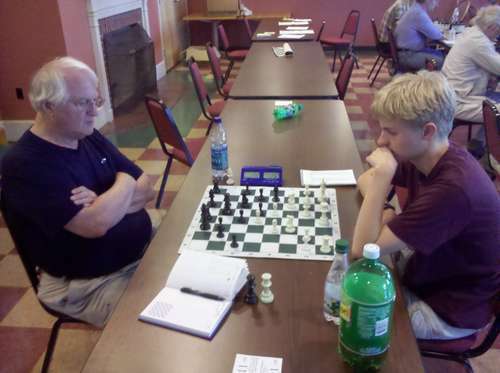 U1650 section winner Nick Parsons (left) plays Frank DiRenzo in round 4. 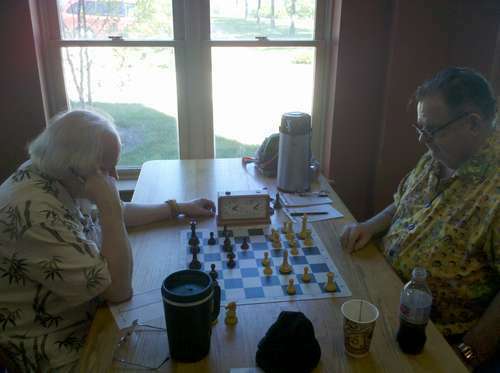 Charles Rotmil (left) faces off against Daniel Patrick Keliher. RBO winner Gheorghe Teodorescu plays Ian Youth to a draw in round 4.